Decreased student enrollments, diminished budgets, and the fiscal reality of declining state appropriations are forcing higher education administrators to closely examine the allocation of funds and resources across the institution. 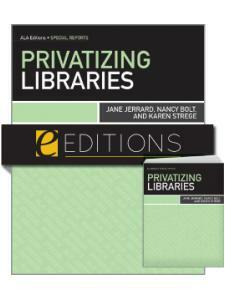 With increased expectations of accountability and transparency for budget expenditures, institutions scrambling to do more with less, and the emergence of new budgeting models that view units as either cost centers or profit centers, academic libraries are under new pressures and scrutiny. 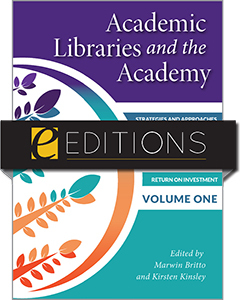 It’s become incredibly important and necessary for academic libraries to clearly articulate to their institutional administrators their contributions to institutional outcomes, short-term and long-term value, and in essence, their return-on-investment. 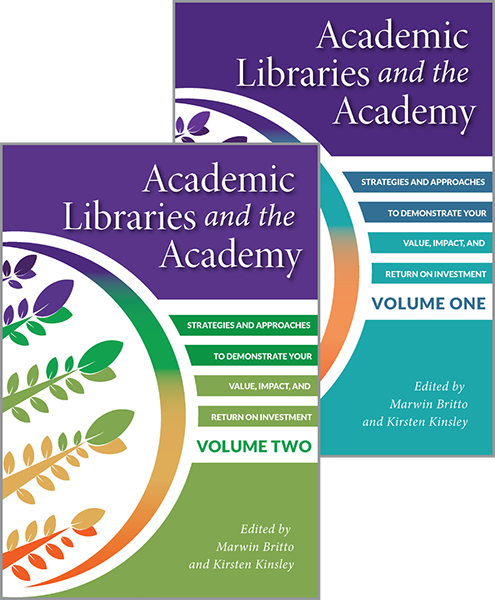 Academic Libraries and the Academy is a thorough collection of best practices, lessons learned, approaches, and strategies of how librarians, library professionals, and others in academic libraries around the world are successfully providing evidence of their contributions to student academic success and effectively demonstrating their library’s value and worth to institutional administrators and stakeholders. This second volume examines assessment activities that are more difficult to measure and generally more time- and resource-intensive: 23 case studies are divided into two sections. The first, Reachable Fruit, examines projects in academic libraries that may require more external and internal resources to measure. They demonstrate the replicability of projects that take six months to one year to collect and analyze. The second, Hard-to-Reach Fruit, includes seven studies that require long-term data collection and feature greater external partnerships, internal infrastructure, or additional resources to measure and analyze. 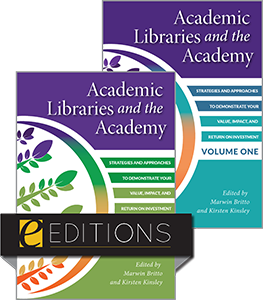 There is no one-size-fits-all approach to demonstrating a library’s worth and value, so Academic Libraries and the Academy captures a range of successful approaches and strategies utilized in different types of academic libraries around the world. Each case study opens with a one-page summary presenting fourteen descriptors of the chapter’s content that will allow you to quickly ascertain if the case study is of immediate interest based on your individual needs, interests, and goals. 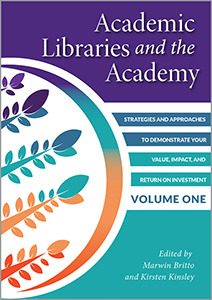 This book is designed to provide guidance and support to many of you—librarians, library professionals, and others involved in library assessment—who struggle to find the best approach and strategy at the right time in your assessment journey, and help you successfully articulate your academic library’s value. Marwin Britto is the Business, Economics, Education and Public Policy Librarian at the University of Saskatchewan. His online, face-to-face and blended teaching experiences span K-12, ESL in Canada and Japan, community college, and university undergraduate and graduate levels. His leadership experiences in higher education include positions as Director of the Educational Technology Center, Executive Director of Online Learning, Director of Instructional Technology, Chief Information Officer, Associate Dean of the University Library, and University Librarian. Marwin has delivered more than 140 refereed conference presentations and authored 60+ refereed papers in academic journals and conference proceedings in the areas of distance education/online learning, teaching and learning, teacher education, instructional technology, library science and change management. He holds four graduate degrees including a Masters in Education (specializing in Educational Technology), a Masters in Business Administration, an ALA-accredited Masters in Library and Information Science, and a Ph.D. in Instructional Technology. For further information, visit https://ca.linkedin.com/in/marwinbritto and www.marwinbritto.info. Kirsten Kinsley is an Assessment Librarian at the Florida State University Libraries and a liaison with the College of Criminology and Criminal Justice, and a co-liaison for the Department of Psychology and the College of Social Work. Kirsten completed her Master of Science in Library and Information Studies in 1999 and received a Master of Science and Specialist in Education degrees in Counseling and Human Systems in 1995 from the Florida State University. In 1989, she graduated with a Bachelor of Science in Psychology with Honors. Ms. Kinsley previously worked for the FSU Career Center Library and Law Research Center and has been working in libraries on campus in various capacities since 1991. Kirsten seeks to foster and measure how the library through campus collaborations can contribute to student and faculty success.